Sea anemone with the help of the clownfish, use all their power with their seductive tentacles to entice their prey. Clown Anemonefish (Amphiprion percula) enjoying themselves on the soft seductive tentacles of the sea anemone. 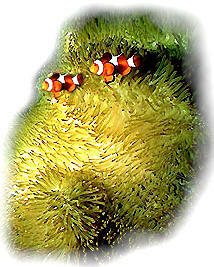 Sea anemone Heteractis magnifica together with a couple of live-in clown fishes amongst its bright green color tentacle and brownish columns arranged in longitudinal rows that can contract and close almost completely in a ball shape. The shrimp, was caught by the anemone with the help of its most loyal referrals the Clown Anemonefish and they will be getting a share of the shrimp. Sea anemone enjoying its food with the help from a couple of clownfish. The shrimp came along, thinking that since it was safe for the clownfish, it would be safe to approach the anemone and was captured by its enticing tentacles. Sea anemone Heteractis magnifica are large sea anemone of up to one meter, densely covered with long rounded swollen tip 8 cm finger shaped tentacles. The Clown Anemonefish can be recognized by its orange color with three white bars (the middle bar usually has a rounded bulge) with black fins markings. This species grows to 8 cm in length and feeds on algae and zooplankton. Clowns fish reared in captivity are very alert with their natural bright orange markings. They swim with a wagging motion, and will dart to the back of the tank at your first approach, then come eagerly back to the front to look at you. Juveniles like Amphiprion ocellaris, may reach up to five inches in the wild. There are about twenty six valid species, all but one in the genus Amphiprion -- genus Premnas are very frequently misidentified and share the same four or five common names. 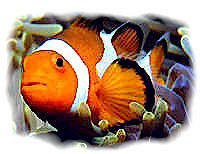 Multiple-striped orange to tan to brown clowns: Amphiprion ocellaris distinguished by the presence of thick black bordering on the white bars are often identified and sold as "percula" clowns. the world at depths from one to 12 meters. happily coexisting together with a live-in clown fish. abundant and easy to capture with hand held net, they are usually found in intimate contact with certain species of sea anemones. Stichodactyla gigantea and Heteractis magnifica, with tentacle columns colors of bright purple, green, red or brown. The diameter of sea anemone Stichodactyla gigantea seldom exceed 50 cm with columns of 1 cm short, sticky oral vibrating tentacles with colors that are usually green or brown with whitish or grey greenish. 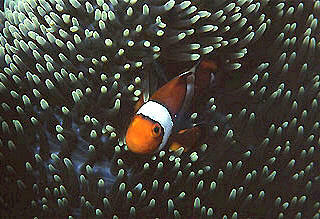 False-Clown Anemonefish can be found in depths from 3 to 15 meters. This one was found off the Tropical Redang Island of Malaysia. Amphiprion ocellaris or know as False-Clown Anemonefish, is orange with black markings on the fins with a white bar on the head, body and caudal peduncle. The middle bar usually has a rounded bulge anteriorly and thrived in tropical marine waters of the Indonesian, Malaysian coast the Japanese Ryukyu Islands, throughout South-east Asia as well as the south to Australia coast.